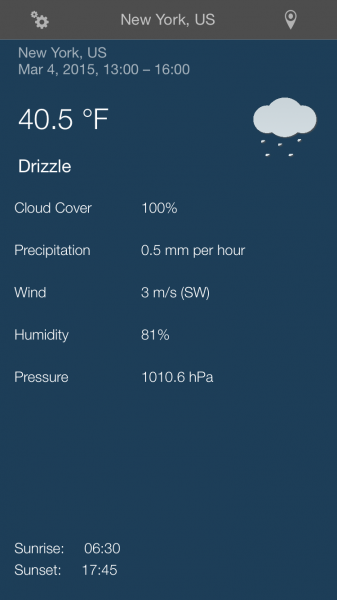 Week Weather ($0.99) by Wolfgang Augustin is a different approach to the weather. 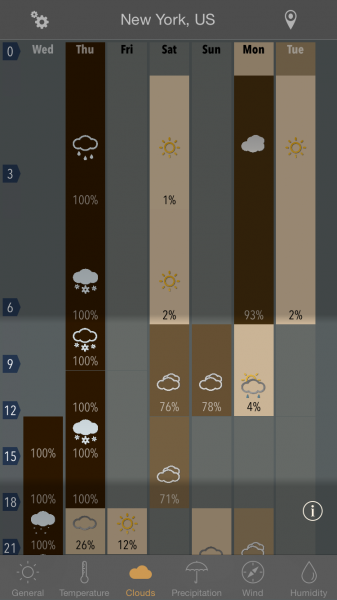 If you prefer quick overviews of the weekly forecast, then this app is made for you. 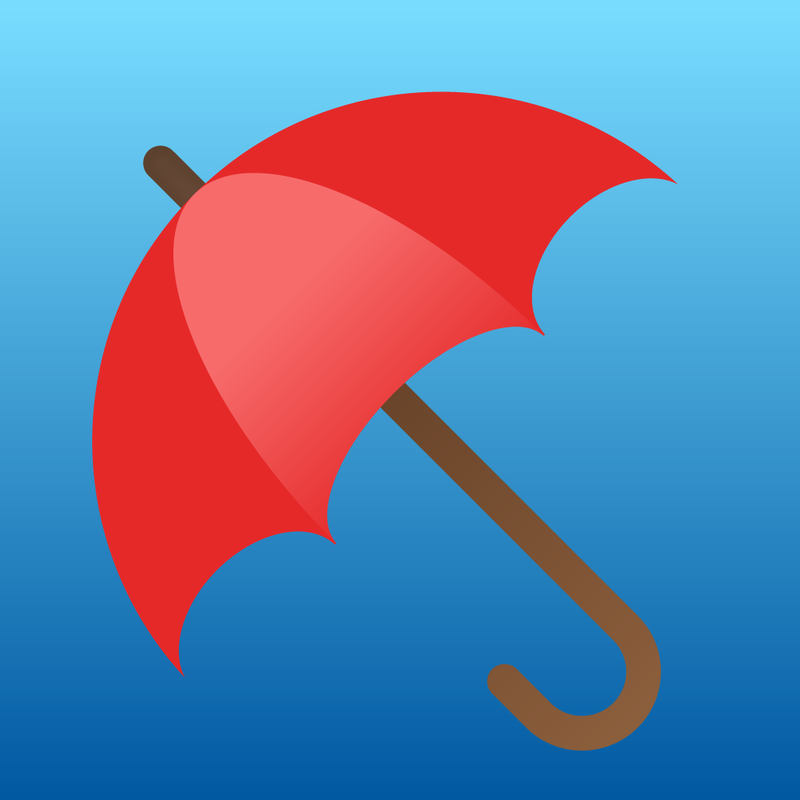 It’s unlike most other weather apps on the App Store, and carries strong resemblances to the now discontinued Reader X, which was one of the first apps from the developer. 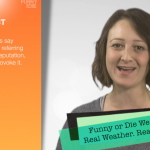 I know — there are a lot of weather apps out there. Personally, my favorite continues to be BeWeather 2 due to the design, comprehensive and accurate data, and the unlimited customization involved. However, that doesn’t mean that I’m not up to checking out new weather apps, such as everyone’s new favorite, which is Storm by Weather Underground. I remember when Reader X (a Google Reader app) was available in the App Store years ago and even reviewed it, as I was intrigued by the design. 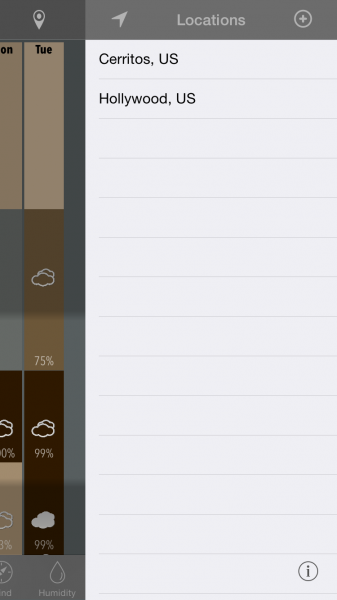 Now the developer is back in action, and took his unique approach to the weather app market. 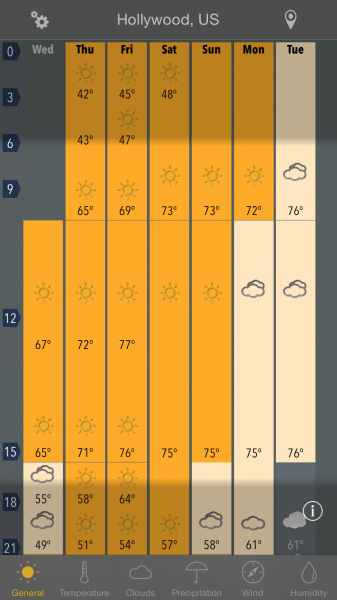 The design of Week Weather is different from your usual weather app fare. 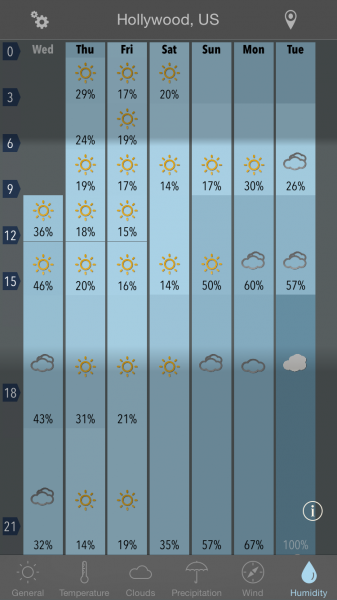 Instead of a large overview of the day, the default view is the seven-day forecast shown as columns spread out across the screen. On the left hand side, you’ll see the day in three-hour intervals, and each column displays the temperature and condition throughout the day. 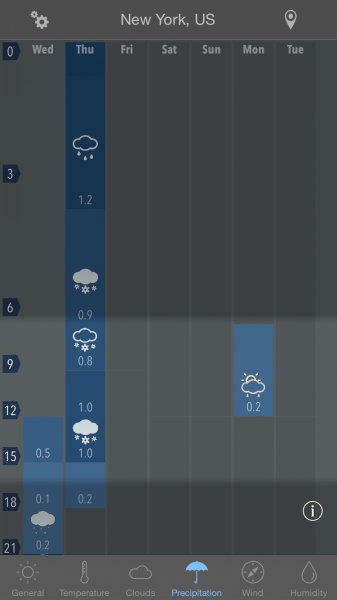 There are six different views of the weather, which you can access with the tabs at the bottom. These include general, temperature, clouds, precipitation, wind, and humidity. A highlighted section on the graph indicates “magnification,” and the first column indicates the present time, since it shrinks as the day goes by. 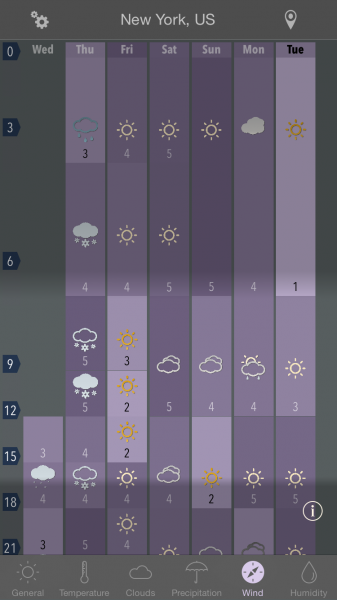 Pulling the graph screen down reveals the day overview, and Week Weather also supports having multiple locations that you can add manually, or use your device’s position. 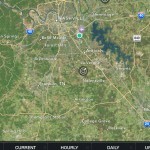 Tapping on the location header bar will refresh data, and you can tap on the cog to get to the settings. Overall, while it may take some time to get used to, the way Week Weather breaks everything down is pretty useful. By default, Week Weather will be on the General tab for the location you choose. This view shows the temperatures and conditions for the week. The Temperature view is about the same as General, with the exception of differently colored columns based on the temperature. 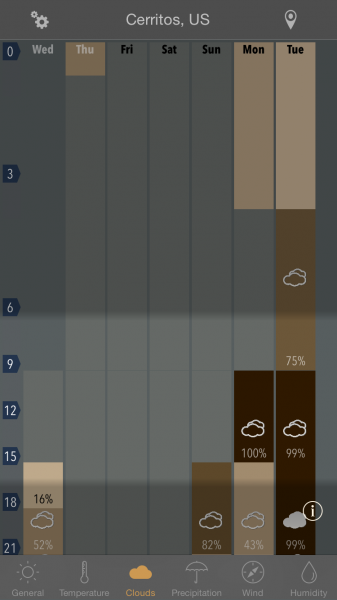 Clouds will show the week’s cloud cover in a neat graph, in case you’re wondering if it will end up being overcast later. 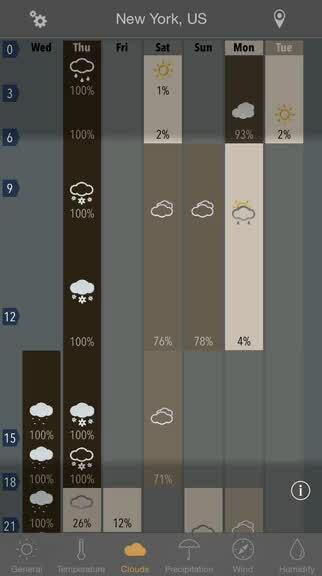 Precipitation reveals the chance of rain or snow, Wind tells speed, and Humidity displays the percentage. Each section of Week Weather is color coded as well, so you’ll never get two sections mixed up besides General and Temperature. If you swipe the screen down, you will see the overview for the day. This screen contains the temperature, condition, cloud cover, precipitation, wind, humidity, pressure levels, as well as sunrise and sunset times. The day view can also be shown for any upcoming day in the forecast — just tap on the bar. When you have multiple locations added in Week Weather, you have to select them one-at-a-time from the locations list. This can be done by tapping on the button in the top right corner, or swiping to the left. If you swipe to the right from the other side of the screen, you access the settings (or just tap the cog button). There are only two settings to change if needed: Units and Color Scheme. While this is fine, I would like to see an option for non 24-hour time. I hope the developer can consider this for the future, as well as more color options. For those who are wondering about the accuracy of the data in Week Weather, it is provided by the Norwegian Metereological Institute. When I compared it to BeWeather 2, which is powered by Weather Underground, I found that Week Weather was off by a degree or two at times. It may not be much, but I still don’t like discrepancies in data. 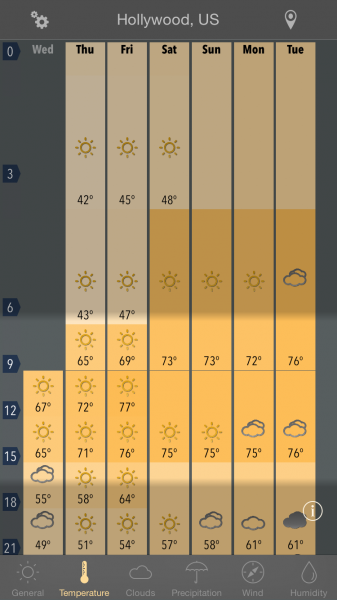 While Week Weather won’t dethrone BeWeather 2 for me at the moment, it is still a useful tool in case you just want to find out what day would be good for certain activities, such as an evening barbecue, surfing, or just a chance to enjoy the sun. If you want a fast app that provides a good overview of the next seven days, then Week Weather is one to check out. 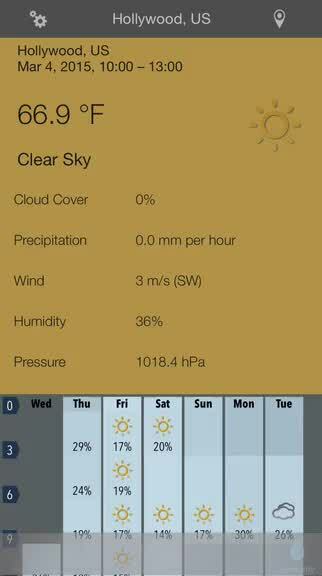 Week Weather is available on the iPhone App Store for $0.99 for a limited time only.